Some Nigerians deported from Libya have tested positive for HIV/AIDS. Screening was carried out by Edo State Agency for the Control of AIDS (SACA). Alarmed by the discovery, the state said it has begun the process of recalling Libya returnees to make them undergo HIV/AIDS screening. 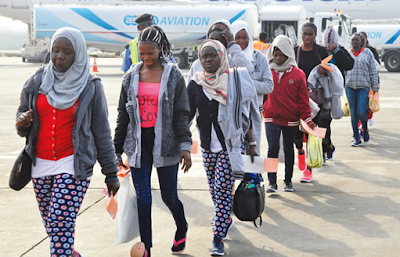 The Executive Officer of SACA, Mrs. Flora Oyakhilome, who addressed reporters while screening some returnees, said the government valued returnees’ health. She said anyone with the virus would be treated. Oyakhilome, who refused to disclose the number of those that tested positive for the virus, said screening was on. She said: “We are making arrangement to recall those who have been deported, to have them tested for HIV/AIDS. We have discussed with the commissioner for Women Affairs. “The woman said she is compiling the list so that they will have the data to know how to get these persons tested and integrated into the society. “We are here to look at the returnees from Libya to advise them and test them for HIV/AIDS. We feel their health is important, their lives are important. So, on that note, the government has said they should be brought here for screening so that they will enjoy a healthy lifestyle. “In achieving a healthy lifestyle, they must be whole. So on that note, we decided to come in so as to collaborate with the committee to have them tested. If we find out that anybody tests positive for HIV/AIDS, we will refer the person to general hospital.